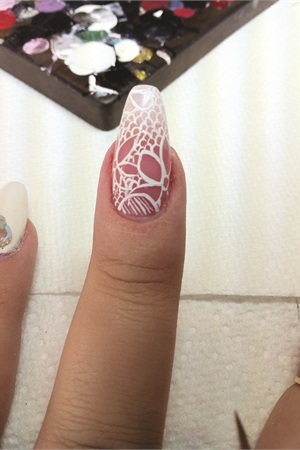 If you appreciate the intricacy of hand-drawn designs, this technique by Lisa Holden of LAH Nails in Oshawa, Ontario, Canada can be beautifully recreated to look exactly like expensive fabric. 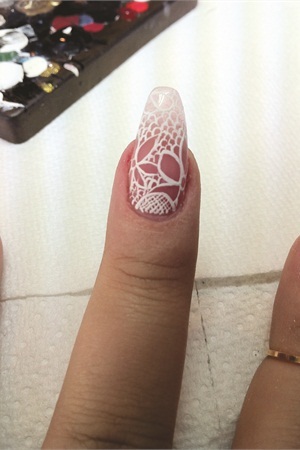 If you appreciate the intricacy of hand-drawn designs, this technique by Lisa Holden of LAH Nails in Oshawa, Ontario, Canada can be beautifully recreated to look exactly like expensive fabric. The design is an exquisite alternative to embedding lace for the upcoming wedding season. The steps allow you to make this design as light or detailed as you want. 1. 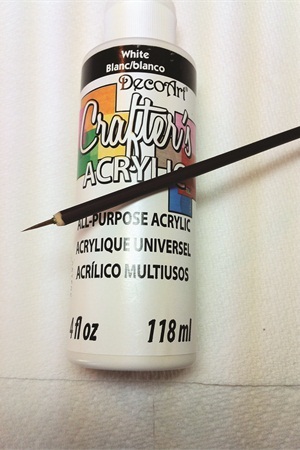 You will need white acrylic paint and a thin paint brush to create this look. 2. Paint nails a translucent pink color. Holden used CND Shellac in Clearly Pink. 3. 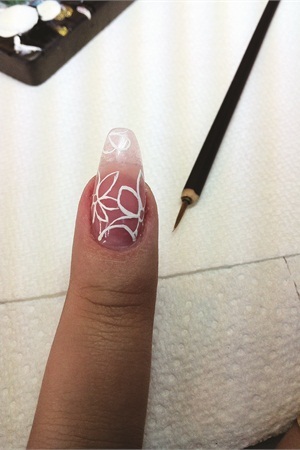 Outline the major shapes you want to see in the lace design (flower, diamonds, etc.). 4. Add a scale-like pattern in the empty space around your outlines. 5. Paint thin lines going in one direction in the outlined shapes. 6. Cross over the same lines you painted in the previous step. 7. Repeat steps five and six in the rest of the outlined shapes. Variation: Stop at step six and leave the flower shapes as negative space.